I think that you get my point: words matter. Pay close attention to them. But I digress. What led me to ruminate so was my close reading of The Humourist’s essay of January 15, 1754. As I read and read and re-read that essay—just as I read and read and re-read—each of his essays, I had an epiphany of sorts. I realized that I was mulling over—savoring, if you will—each and every word. Records. “Anything preserving information and constituting a piece of evidence about past events; esp. an account kept in writing or some other permanent form; (also) a document, monument, etc., on which such an account is inscribed” (Oxford English Dictionary, the 4th definition of the noun). It was in the answering of those questions that my minor epiphany came: The Humourist uses the word Records (as a noun) with some frequency. I could recall—though I knew not where—that he had used it in several of his essays. So, I set about the task of re-reading—well, actually, skimming and scanning—all of the essays to see if my recollection served me well. And, as we have seen already, he uses the phrase “Records of drama” in the essay that we are exploring today. While I am reluctant to ascribe too great a significance to one mere word, it strikes me that The Humourist’s use of the noun Records strengthens the appellation that I gave him in my Controlled Revelation # 1. The Humourist is a Historian. My goodness! One word has led me—and you—all over the place. Note, however, that it is exactly this kind of close reading that fosters and enables greater understanding and greater appreciation of any passage. What else did I discover as I gave The Humourist’s January 15, 1754, essay a close reading? Aside from confirming my notion that The Humourist is a historian, it confirms as well that The Humourist is well versed in drama. Indeed this essay stands as perhaps the earliest essay in American Literature to exalt positive impact that tragedy has on mankind. Thus we have still another confirmation of an earlier claim: The Humourist is a lover of literature with a preference for drama. I’ll share my results with you next week. In the meantime, remember: words matter. Pay attention to them. Celebrating Scholars and Poets and Librarians! I love Robert Frost, and I especially love his essay “The Figure a Poem Makes.” I’ve been thinking about that essay a lot today, because I am here in Charleston, South Carolina, on a scholarly research trip. And I have conducted my work, as Frost said scholars conduct their work, “with conscientious thoroughness along projected lines of logic”. Projected lines of logic. Ah! Yes! As those of you who have been following my blog know, I have maintained for some time that I am 99% confident that I know the identity of The Humourist. Trust me: I do! And, as you also know, I have been giving The Humourist essays a close reading, noting the clues that allow me to explore my authorial speculations along projected lines of logic. Indeed those projected lines of logic have guided me throughout this research trip: projected lines of logic. My hope was that if I could find the Last Will and Testament of the person whom I believe to be The Humourist it might contain specific bequests that would in one way or another connect to the esoteric content of The Humourist essays. I have reviewed the Last Will and Testament, and, indeed, it contains bequests that parallel certain specifics mentioned in the essays: specifics dealing with art and with history. It is not possible that two people living in Charleston, South Carolina, during this same timeframe could have had the very same, identical, specialized interests. I realize that “art” and “history” are not specialized. Yet, for both of these fields, The Humourist has identified specialized angles. I have revealed some of them to you already. I will reveal no more, at this point, except to say that I now have the clincher that I’ve been looking for! Mind you: I will continue giving The Humourist essays the close reading that they warrant. And when I am done with the deed, I will reveal all. For now, I have enough to move me from 99% to 100% certainty. More, I have found clinchers others than those in his Last Will and Testament. Today, as I read issues of The South Carolina Gazette housed in the South Carolina Library Society, I found notices of property for sale—property owned by The Humourist. The location of the property aligns perfectly with references that he makes in two of his essays! Yes! Yes! And, though I am no poet, I like to think that I would have met with Frost’s approval of my “poetic” way of seeking knowledge, too. Whenever I am doing research, I approach what I am doing rather “cavalierly.” I approach “nothing deliberately.” I let what knowledge will “stick” to me “like burrs where [I] walk in the fields.” The discoveries are remarkable. Thus—and as is my custom—when I finished my formal scholarly research today, I was reluctant to put aside The South Carolina Gazette without taking a purely “just for fun” walk through its fields. So, without then knowing why—yet, now, with full understanding, and in like fashion—today I closed my eyes, opened The South Carolina Gazette, and let my finger drop wherever it might drop. Your Pride and Boast! Apollo’s darling Son. The Muses weep for Thee, immortal Bard! Thou’rt gone! And with Thee all their Glory’s fled. And glads all Heaven, with his rapt’rous Praise! To mend the Heart, and to inform the Mind. And boldly in the bright Paths of Virtue trod. Well levell’d slew, —— and slung the guilty Heart. The Poetick Fire? The heavenly Flame! Scourge the base Follies of a guilty Age? Informs the Mind, and makes the Heart to glow. With Men of Genius, to the End of Time. Like thy bright Soul! ne more immortal Blaze! The dazzling Beauties of great POPE to paint! Who only shew my Weakness, when I’d praise! As thy own Works: That brighten into Flame. Who can, O POPE! Thy Sacred Laurel wear? Who can, alas, the dazzling Lustre bear! Who can, like Thee! Lift up the Sacred Rod? The Power’s not of Man —— ‘tis the Gift of GOD. The GREATEST POET and the BEST OF MEN. Is this not incredibly wonderful? Just think: someone in Colonial America—someone in Charleston, South Carolina—penned such a poetic tribute to Alexander Pope on the occasion of his death! How wonderful that the poetic tribute still exists in a newspaper that has survived against all odds for all these years. Now that’s life everlasting not only for Pope but also for Philagathus! It’s also life everlasting for librarians—the unsung keepers of our vast storehouses of treasured knowledge, whether scholarly or poetic. 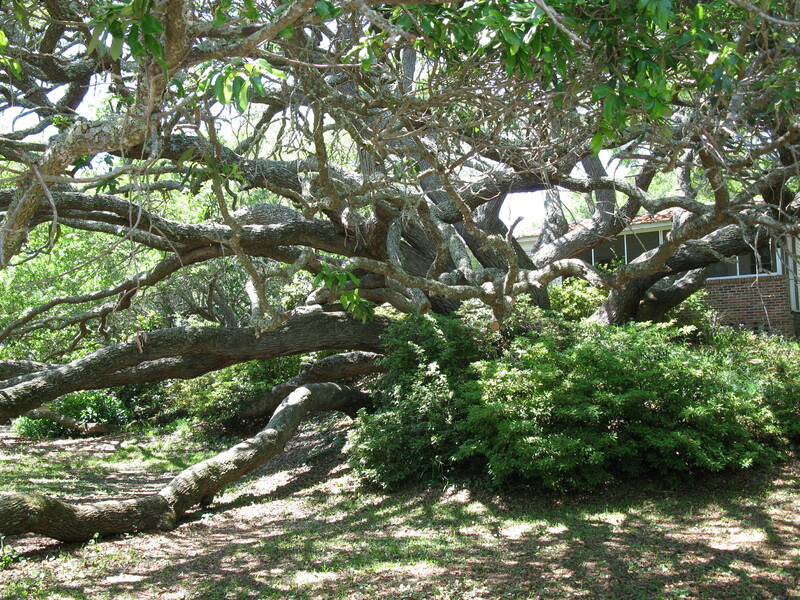 My Humourist post for today noted my location: Sullivan’s Island. It noted as well that Edgar Allan Poe was at Fort Moultrie on the western end of Sullivan’s Island for thirteen months and while there gained the inspiration for his story “The Gold Bug”—a story about a beetle that leads to a buried treasure! Great! So, that’s how I started my day. Afterwards I went to the Charleston County Public Library to research wills and plats. More on my findings tomorrow or the next day. Let me tell you, though, that I have but one word to describe what I found: PHENOM! Stay tuned. You will be as stunned as I was/am! After my research, I returned to Sullivan’s Island. Allen and I thought that it would be fun to bike around the island. We’re staying at a marvelous historic home, located on Station 28. So, off we went, biking. We had nowhere special in mind, mind you. We just wanted to bike, mindlessly. We just wanted to explore, mindlessly. And so we did. We biked. Mindless. Mindlessly. Toward the end of our trip, and, indeed, just a stone’s throw from our “home away from home,” we spotted the most spectacular tree that either of us had ever seen in our lives. We nearly fell off our bikes at the same time! We stopped, drop dead. And, just as we were gawking, a woman walked down the driveway that led to the house behind the tree. I didn’t know. To me, it was just a drop-dead, spectacular tree. “Yes,” she said. “This is the Gold Bug Tree. But It wasn’t quite this big when Poe wrote his story. It’s grown a lot.” She smiled—a big wide Southern smile, full of pride. The Gold Bug Tree, right there in her yard. Right there, in front of her home. Right there, in front of me. Right there in front of me—a tree that I had read about but not a tree that I had ever in my wildest imaginations expected to see! I had no idea that such a tree ever, ever, ever existed! And here I stood, drop dead in front of it, admiring it without even knowing its literary significance. She walked back up the driveway leading to her home behind the famous tree. 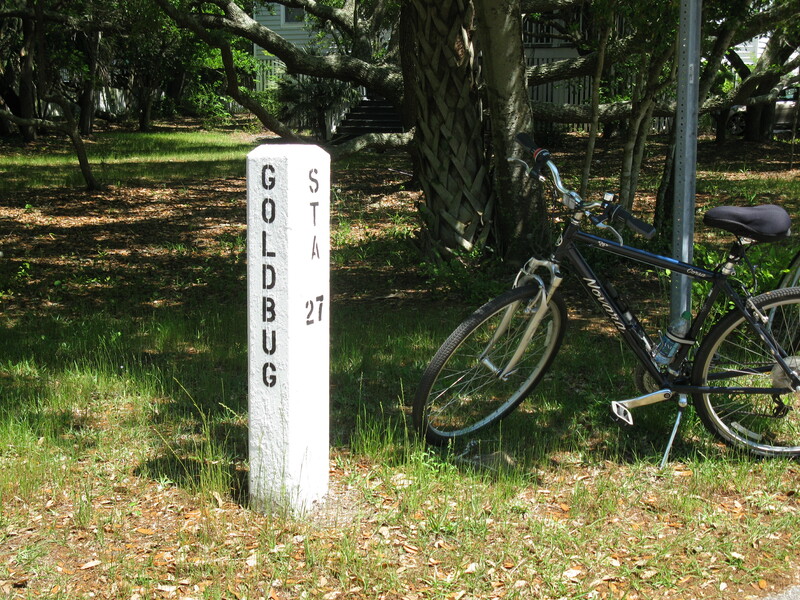 We biked back to our less famous rental home on Station 28, and then we returned to The Gold Bug Tree at Station 27. Without a doubt: we had to take pictures. Two photos follow: one of the tree; the other, the corner marker where the tree reigns with commanding magnificence! I have but one word: Serendipity! Share with me my serendipitous day! 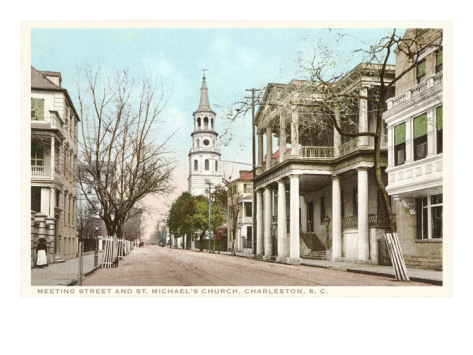 Later this morning, I’ll be visiting the South Carolina History Room, Charleston County Public Library. I want to examine some land plats from the 1750s when the Humourist was publishing his essays in the South Carolina Gazette, and I want to examine some wills from the period. Obviously, I’m looking for the will of the person I believe to be The Humourist. I want to see whether the will contains any information that might confirm that he is actually the writer! I realize, of course, that it’s a long shot, but who knows! Last week, I was chatting with one of my colleague’s about my research, and I mentioned to him that I was 99% certain who wrote the essays, but I still hoped to find a direct statement somewhere that “Mr. X” was The Humourist. My colleague looked at me and wisely replied, “You’ll never find it because it probably doesn’t exist.” He’s probably right, and I know that I won’t find such a statement in The Humourist’s will. However, I might find such a statement in someone’s diary, someone’s journal, or someone’s letters. And who knows: I might just find it on this research trip. I keep reminding myself, however, that identifying the author of these essays is only part of my project. The larger and more important part is making the Humourist essays available to students, scholars, and the world at large. I am well on my way to doing just that by making the essays available here in this blog. “The Humourist is a plagiarist, and I have just unwittingly disclosed what may well be the first documented case of academic dishonesty in Colonial America. Since last week, I have discovered that Chimaericus Cantabrigiensis was a pseudonym used by English poet Christopher Smart (1722-1771). Smart, not The Humourist, is the author of the “Castle Building” essays that appeared in The Student. Controlled Revelation #3: Numerous Confirmations and a New Research Discovery/Challenge that Has Me Reeling! This week, as we give his essay of December 24, 1753, a close reading, we will discover numerous confirmations that he played those parts well, but we will also discover a new research challenge that, quite frankly, has me reeling on my own research stage! Let’s start with the confirmations that I have discovered this week. We’ll save the new discovery/challenge for the end of this post, thereby allowing it to become the grand finale. We have major confirmations, of course, that the Humourist is a lover of literature. Interestingly enough, however, his literary selections and references begin to show a genre preference: drama. This week, for example, we find him quoting from Shakespeare’s “Prologue” to Henry the V: “Into a thousand parts divide one man, / And make imaginary puissance.” Further, he makes reference to the “Abel Drugger”—a character in Ben Jonson’s comedy The Alchemist, first performed in 1610. Again, what we have is a confirmation that the Humourist is knowledgeable of drama. More, though, we have a means of determining, with some accuracy, the Humourist’s age. He says that he has run through the several stages of life and that he is happy to find his finances in tolerable order. Clearly, he is past the fourth stage of life—the soldier stage—focused on seeking the “bubble reputation.” The Humourist has achieved that already. He seems to be in the fifth stage of life—the justice stage—focused on comfort and wise sayings and playing the part well. This is the stage of life generally achieved in our fifties. I feel fairly confident in saying that the Humourist is in his mid- to late fifties. Also, the essay establishes the Humourist to be a Poet, as evidenced by his “Song,” the first of several original poetic flights that he would take. Further, in his “Advertisement” promising to publish the anatomy of human heads, he indicates that the work will be “illustrated with near a million of worthy personages, as engrav’d by the best masters.” This new angle—engraving—intrigues me and will be set aside for further rumination. Thus have I shared “gleanings” from my close reading of the Humourist’s December 24, 1753, essay—gleanings that confirm that which we knew already and at the same time sharpen the focus of what we know about the Humourist: he’s a lover of literature, yes, but he is knowledgeable of the theater, and he is a poet. He’s a painter, perhaps, but he knows how to draw and he may be familiar with engraving. Finally, he shares with us the fact that he has run through the several stages of life and has his finances in order, thereby establishing (with some accuracy, I believe) that the Humourist is in his mid- to late fifties.